If the Red Tail Hawk has crossed your path, you have been blessed with a sign of great power and positivity. Hawks, in general are all about perspective; seeing things acutely from a distance, seeing the big picture and the details within in isolation. The hawk has such acute vision, it is an adept and swift hunter who enjoys great success. Many have written on the red-tail hawk as a sign of great personal awakening. This powerful spirit guide can bring you messages of who you are to become, and information regarding your soul’s path. The red tail is associated with kundalini energy, a life force which activates at the base of the spine and moves up through the crown in order to connect all the chakras with the cosmos beyond the crown, bringing great healing, power, and energy to the awakened. 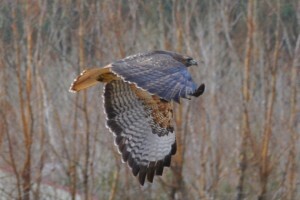 It is believed that the red tail hawk only comes to you after the kundalini has been activated. It may also bring confirmation that childhood dreams are now in the motion of realization. Hawks are territorial hunters and they do enjoy showing off for humans, so when they are around, and you may know this from their shrill cry, they are often obliging in coming close, and maybe even flashing you that red tail. The hawk feeds off of rabbits, rodents, and snakes – all powerful totems themselves. Red tail hawks are of the soaring variety, and as a totem animal, they will stay with you all of your life. You may soar above others as well, and could be the object of attacks by smaller species. The red tail hawk is about vital energies and their expression, creative power, and life force energy rising. Expect a rapid expansion of your psychic abilities and a great power in your expression when this animal comes to you. You can use the red tail hawk’s visit as an affirmation of this increase in ability and a reminder to keep focused, to observe details, but not to be overwhelmed by them.